SPRING CLEANOUT SERVICES START FEBRUARY 15TH! 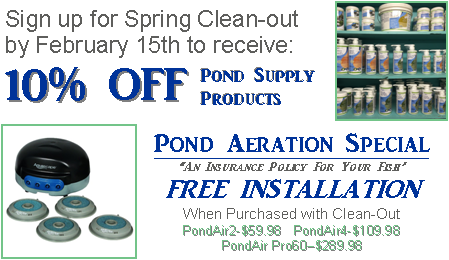 Contact us today to get your pond or water feature on our list for Spring Cleanout! This list fills up fast so ACT FAST! Size of Pond (L x W x D), Total Gallons Enter the dimensions of your pond in feet. If you are unsure about this number, just imagine what the length and width of a rectangle would need to be to completely cover your pond. Pump Enter any of the following: Name/model, flow rate (in GPH), any descriptive information that may be helpful. Date It Was Last Cleaned? If you are unsure, just provide your best estimate. Number and Size Range of Fish? Will you be present during service? What day would you like to schedule your cleanout? Note: We will do our best to schedule you on or near this date, but please understand we have lots of cleanouts to do! Please send us 3 pictures of your pond. Please try to capture the pond in its entirety and from different angles. Do you need lighting? Do you have a water ionizer (e.g. IonGen) and does your probe need replacing? Leaks? Other issues?